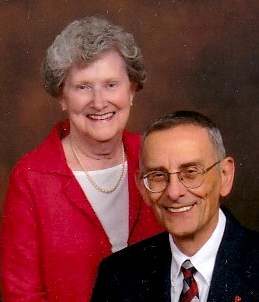 Betsey and Dave Russo, members of St. Eleanor Parish in Collegeville. 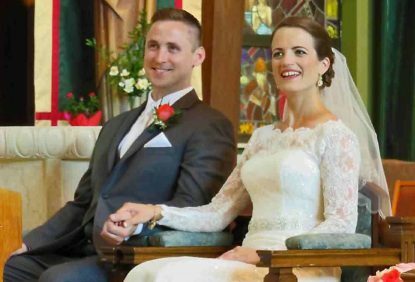 The couple has served on marriage prep programs at St. Eleanor’s for about 10 years and at least that long in their former parish in New Jersey. Dave and Betsey met when they were college students, he at Siena College in Loudonville, N.Y., and she 10 minutes away at the College of St. Rose in Albany, N.Y.
Their romance was on hold at least long-distance while he was away at graduate school, but four years after they met they were wed in 1966 at a little mission chapel in Highland, N.Y.
Now they are the parents of two daughters, Kathleen and Cara, and grandparents of five grandsons. The secret of a long and happy marriage? “Commitment, faith in God and faith in each other,” Dave said. Both Dave and Betsey agree the purpose of their marriage, and every marriage, is holiness to help one another get to heaven. That is their focus, and their responsibility is to grow together spiritually. Yes, there are hard times, especially Illnesses or economic setbacks. But among the greatest joys is seeing the achievements of their children and being part of their grandchildren’s lives. As a final thought, “Marriage isn’t just a contract, it is a covenant before God,” Betsey said. 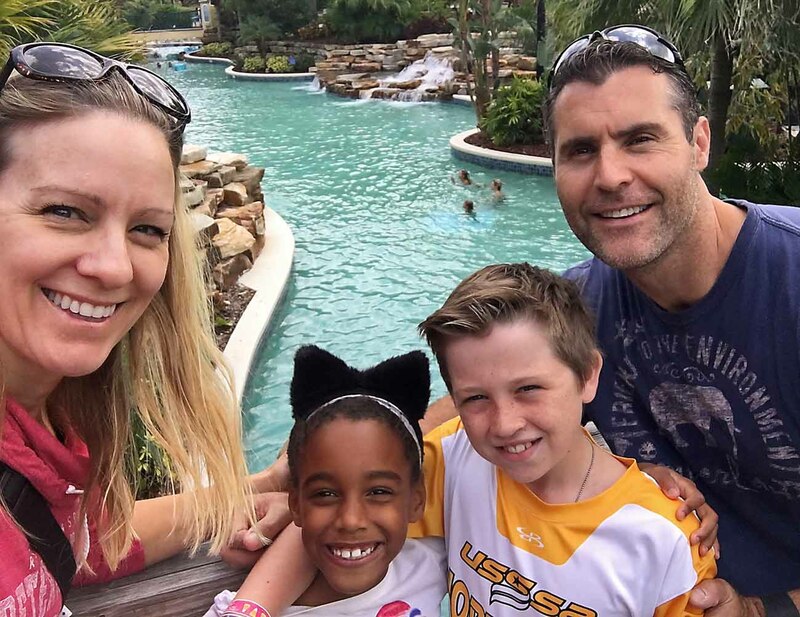 Steve and Beth Grandizio of St. Philip Neri Parish in Philadelphia spend time on vacation with their children, son Marshall (right) and daughter Emme. 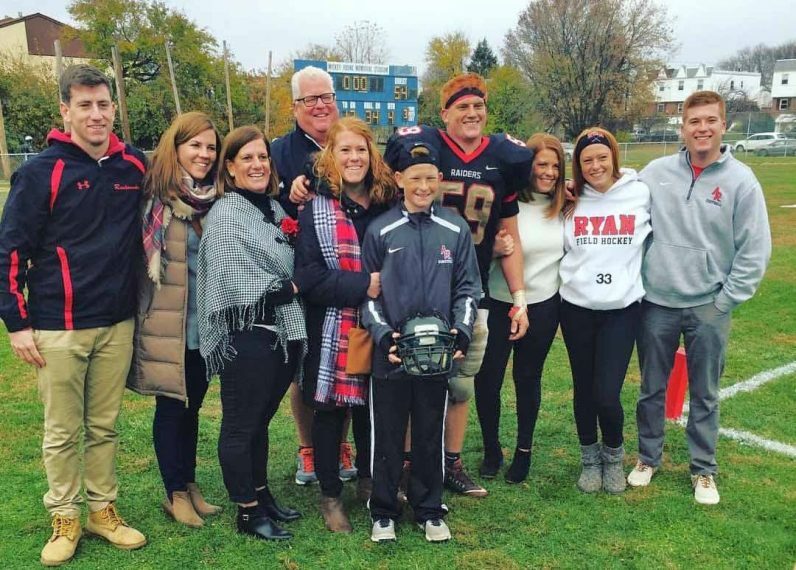 Steve and Beth Grandizio of St. Philip Neri Parish, Philadelphia, have been married over 21 years, but their meeting was pure chance in June 1994. She was a flight attendant from Michigan in Philly for a layover, he had just graduated from college and was really down in the dumps because he hadn’t been drafted by a major league baseball team. They really hit it off, and she started grilling him. Are you Catholic? Are you Republican? Her theory was if you eliminate religion and politics there isn’t much to fight about. They kept in touch and meanwhile Dave got a minor league contract with a team in Ohio. Beth had a sister getting married that September and shortly before that she called Steve and asked him to be her date. His team was in the playoffs and he wasn’t sure he could make it. Luckily, as it turned out, they were eliminated so he drove to Michigan on the wedding day, and got to meet all of her relatives and friends at one time. That’s about when they got engaged and they were married one year later, in September 1995. They moved around a bit while Steve played minor league ball before settling in Philadelphia. “At first I realized I really didn’t know him well but his mother did a good job in raising him, he was easy to live with,” Beth said. Beth’s uncle, who was a priest, did their marriage prep instructions and he stressed the importance of communication. Both agree that was sound advice. Steve and Beth wanted to start a family immediately, but to their disappointment, it didn’t happen. After 10 years, through Catholic Social Services they adopted their son, Marshall, and four years after that their daughter, Emme. Because of schedules including the kids’ sports, more often than not they are at another church on Sunday, but Mass is a must, often satisfied through consultation with the website Masstimes.org. A key to a good marriage? “Never stay angry,” Beth advises. Dan and Becca Dougherty, on their wedding day Aug. 15, 2015 in St. Andrew Church, Newtown. Dan and Becca Dougherty of St. Andrew Parish in Newtown knew each other when they were both on student council at Council Rock High School. He was 16, she (Becca Pine at the time) was 15 and they were buddies, nothing more. Time went by; they graduated and went their way in separate lives for 14 years. Dan was living in Texas and still single when he came back home for a visit. He’d fallen away from the Catholic Church for a while and had attended evangelical churches. But something was missing — the Eucharist. Dan knew his dad and her dad were in the same prayer group, and Becca’s family ran a nearby Catholic book store. He went there and hung around a bit until she came in and they resumed their conversation. Becca just smiled. She had dated others but nothing came of it and she liked how straight-forward Dan was. By August they were engaged and married the following year on Aug. 15, 2015. They honeymooned in Rome where they got a chance to see the pope. Now they have a little girl, Sophia, and are living near both of their families. Before they married they took the marriage prep course put out by Ascension Press. Now they are presenters for it. Dave and Bobbie Ruskowski, who married in 1989 and are members of St. Christopher Parish in Northeast Philadelphia, recently visited New York as a treat given to them by their children. At the Mass at St. Patrick’s Cathedral the priest in his homily noted how few big families there are anymore. “Most people don’t know how to make sacrifices, like people with big families do,” the homilist said. Bobbie (formerly Bobbie Lynch) and Dave smiled to themselves. Been there, done that. They knew all about sacrifices. They first met at a club in Bensalem. She thought Dave was handsome and sensitive, and very funny. He was equally drawn to her. They kept in touch and found they had so many interests in common. Then after a nine month engagement, they married at St. Christopher’s and settled down to doing what is the single most important side of marriage — raising a family. Now they are the parents of eight — Ellen, Maura, Maggie, Joe, Matt, Brendan, Jeannie and Jack — all ranging in age from 26 to 11. But Bobbie was already familiar with a big family because she was one of nine and Dave was not far behind as one of five. The truth of the matter is, when they were first married Bobbie missed not having her siblings around her. For Dave the biggest change was the responsibilities of marriage which forced him to grow up. Bobbie is a former teacher, while Dave is a driver for Aramark. Their marriage is built around “communication, faith and respect.” Part of faith means attending church together as a family at least as much as possible, since a few of the kids are off to college. They wouldn’t change their lives for anything, they agree. Dave and Betsey, Steve and Beth, Dan and Becca, and Dave and Bobbie all bring differing insights from their marriages but they share in common the conviction that marriage is a sacred, lifetime bond, and if it is God’s will, they have an openness to children who will make their lives complete. The Ruskowski family including Bobbie and Dave, third and fourth from left, and their eight children. They are members of St. Christopher Parish in Northeast Philadelphia.